Ripple Code Review – Make $7,000 Per Day through Ripple Ad Flipping? There is no reason to lighten the blow or sugar coat it, Ripple Code is a ridiculous and moronic cryptocurrency scam. Operating from the landing page, adflipping.com/ripple-code/private.php, Ripple Code is an outrageous marketing scheme that can allegedly enable cryptocurrency enthusiasts the ability to make $7,000 per day. Creating an illusive veil of empty promises combined with a rudimentary promotional video, it is evident that the creators behind Ripple Code are targeting novice investors. As you will quickly learn throughout our unbiased review, Ripple Code operates as a deceptive ad flipping hoax that not only promises returns that are too good to be true but also possesses the same alleged founder from Bitcoin Code which we have previously exposed as a scam. Ripple Code functions as an elementary landing page that is meant to sway newbie investors into believing that they were fortunate enough to visit their site. Supposedly operating as a beta test system, consumers who happen to stumble upon this site are only confronted with a landing page, a feeble promotional video along with a few financial claims. Allegedly operating as an online crypto ad site, Ripple Code is an automated ad surfing portal that browses various crypto ads which results in users generating capital. While the theory behind Ripple Code’s functionality may sound promising or maybe even intuitive, there is no transparent evidence to support their claim. No reference regarding which crypto-based advertisements being utilized is disclosed along with no mention of compensation per ad or why members need to deposit into their platform are entailed anywhere on their page. When it comes to confronting the reality of Ripple Code, and as you will shortly find out for yourselves, this platform is solely a deposit trap meant to solicit and deceive innocent people out of their hard-earned money. Who is Behind Ripple Code? According to the footer of the Ripple Code landing page, it is implied that Ripple Code is operated under the supervision of Ripple Code LLC. While we found no reference of Ripple Code LLC being an active corporation, we did come across another lead into who may be the founder of their operation. While the Ripple Code promotional video featured at adflipping.com/ripple-code/private.php only renders a shorten version of their original promotional video, if you right-click on their pitch video and copy the video URL you will be able to see it’s extended version on YouTube. 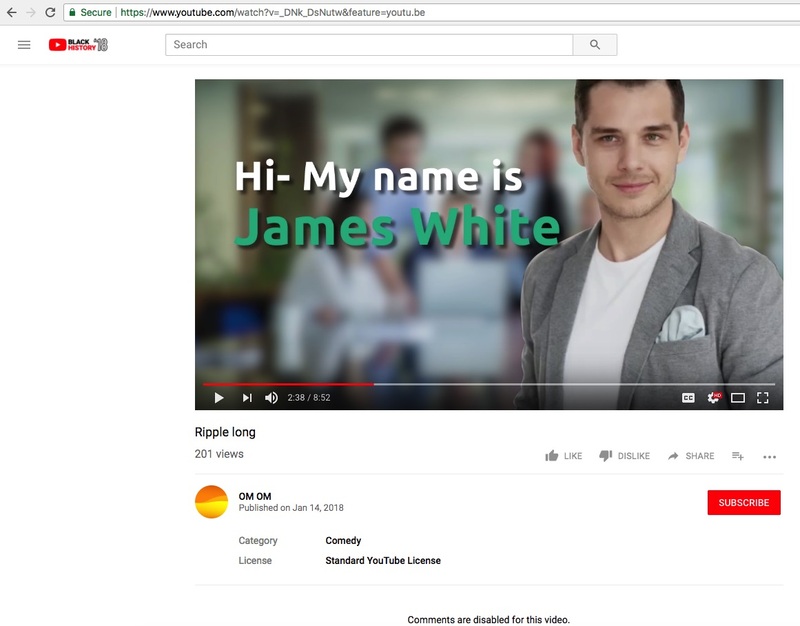 At 2:38 of the original Ripple Code promotional video you will notice that the alleged founder behind their operation is James White. According to the video, James White was originally a software developer who turned into an investor to only later on turn into a millionaire-maker. Claiming to have been featured on the Wall Street Journal, CNN and Forbes, we could find no reference to James White or Ripple Code on any of those 3 media sites. Furthermore, he claims that just after 90 days of using his beta version software, he turned into a millionaire, but as you can imagine no transparent or verifiable evidence is ever disclosed. Ripple Code essentially operates as a nesting ground of deceitful falsehoods. Ensuring investors that they can generate over $7,000 per day by utilizing their automated crypto-based ad flipping system is not only far-fetched but absolutely ridiculous. Claiming to be featured on major news portals but failing to churn up in any search results also doesn’t go towards building their credibility. Then of course we have the fact that their alleged founder is the same creator behind another cryptocurrency scam we exposed known as Bitcoin Code! Giving a suitable rank for Ripple Code cannot effectively be completed due to the fact that the entire Ripple Code operation is operated from a landing page. Serving as a pitiful campaign for adflipping.com, the closest reference point we could find in regards to Ripple Code’s release date would be from the date that their YouTube video aired which would be January 14th, 2018. Can Ripple Code be Trusted? As soon as we landed on the Ripple Code landing page it was evident that this operation was a scam meant to target cryptocurrency novices. Providing no transparency while fabricating every element integrated into their site just goes to show how untrustworthy of an operation Ripple Code truly is. Ripple Code is a baseless and ludicrous investment opportunity angled around a deceptive marketing ploy. Preying upon innocent and newbie cryptocurrency enthusiasts, not one characteristic exhibited from Ripple Code is authentic. Show a clear-cut connection with another scam that we have previously exposed it is obvious that Ripple Code is not a legit investment opportunity and should be avoided like the plague that it is. Review Verdict: Ripple Code is a SCAM! Do you have any experience or knowledge to share regarding Ripple Code? If so, please leave a comment below or contact us via email. To receive the perks of getting free reviews and scam warnings directly to your inbox, subscribe to ScamBitcoin.com and become a member! To learn about trustworthy and legitimate cryptocurrency investment routes, we recommend browsing our Day Trading Guide.